England centre Jonathan Joseph has revealed he played in two World Cup games with only one third of his chest muscle still attached to the bone. Joseph tore a pectoral muscle against Fiji in the World Cup opener and missed the loss to Wales before returning to face Australia and Uruguay. He learned the extent of the injury after England's exit and had surgery. The 24-year-old said: "I was going to do everything I could to play. I wasn't aware there was only a third attached." 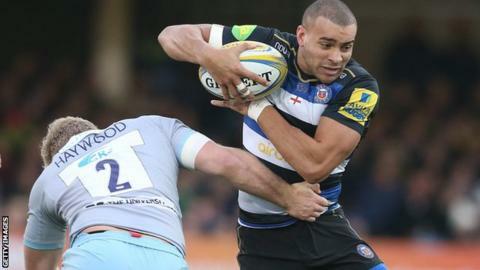 It was on Joseph's return to his club Bath that he had a scan on his chest and subsequently underwent surgery which was expected to rule him out for three months. "I felt something in my pec and wasn't too happy about it as I'd done the other pec before and it felt a little bit similar," said Joseph, who started in the defeat to Australia two weeks after sustaining the injury. "I did everything needed as far as reaction work was concerned, strapped it and managed to play against Australia and Uruguay with no dramas. "When I got back to Bath, they had a little play with it. I had felt something in there during the Uruguay week but wasn't too concerned. "Bath had it scanned and in fact I only had about a third of the muscle still attached." The influential outside centre, who scored four tries in the 2015 Six Nations, returned to action last weekend against Northampton a month ahead of schedule. His earlier-than-expected comeback was a boost to his chances of featuring in England's opening Six Nations match against Scotland on 6 February. Joseph said it was important for "everyone to put a marker down" to impress new head coach Eddie Jones, who replaced Stuart Lancaster in November following England's failure to progress beyond the World Cup pool stages. "It's a clean slate with a new coach so I'm glad to be playing a lot earlier than expected and to put my best foot forward."